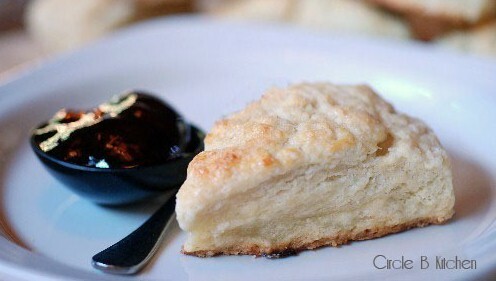 Like many of you, my first scone experience was not a good one; I was very much not a fan. I had one of those dry, crumbly bricks that maybe you've experienced too and gives the whole genre a bad name. I sort of avoided them for many years after that, and it wasn’t until I had a really wonderful scone at a little bakery in Santa Cruz, Ca. that I decided they had the potential to be exceedingly delicious. Since then I’ve experimented with different scone recipes and have some real favorites that I’ve posted here, here, and here. And then the other day I made these and absolutely fell in love with their understated simplicity. They’re amazingly light, yet dense and moist, and just seem to melt in your mouth. Of course, you could add your favorite fruit to these… blueberries, cranberries, nuts, any number of things would be wonderful here. But that’s not really what these scones are about. They’re mostly about experiencing the very subtle tang of buttermilk, a moist, dense crumb with a little crunch from the raw sugar topping. I loved these plain and it’s how I recommend you serve them. But I couldn’t resist a little scoop of my cousins’ pomegranate jam with them one morning, and I will just say that as good as these are plain, they also accommodate a bit of jam quite nicely. Put dry ingredients in food processor, pulse to mix. Add butter, pulse until butter is in pieces about the size of a hazelnut. Dump into a mixing bowl. Pour in buttermilk and mix with a fork until a shaggy mass forms. Add a little more buttermilk if need to bring the dough together and form into a ball. Cut in half. Form each half into a disk about 1 1/2 inches high, and cut into 4ths or 8ths. Place on a parchment lined sheet pan and freeze for 20 minutes Remove from freezer, brush tops with a little buttermilk and sprinkle liberally with the raw sugar. Bake for about 12 minutes. Cool slightly on wire racks and serve warm.